Last night I was flicking channels on the TV and stumbled across the domestic T20. Kieron Pollard hit two of the biggest 6's I've ever seen and that got me thinking, in my special West Indian beer package did I have anything from Trinidad & Tobago? The answer is yes, Carib Lager. The beer from Pollard's home country is one of the most popular in the Caribbean. It is also one of the oldest beers in the region, first being brewed in May 1950. I'm looking forward to a lager tonight so hopefully this is a good one. Carib Lager pours how you would expect any top European lager to pour. The beer is a lovely golden straw colour with a brilliant white three finger head on top. There appears to be plenty of carbonation bubbles to sustain the head but it fades to a ring a little too quickly for my liking. However for me it is still the pick of the Caribbean beers I've had in terms of appearance. Surprisingly there is also a bit of a nose on Carib Lager. There is plenty of sweet malts present as well as something incredibly unusual to find in a tropical lager: HOPS! The hops are both grassy and spicy and are relatively distinct. Absolutely no hint of skunk is present! If the nose is any indication Carib Lager may well be the best tropical lager I've ever had. After the nose the taste is a little bit of a let down. Don't get me wrong the flavour is still quite nice, I was just led to believe that there would have been more hops. The slightly spicy hops are present and balance the otherwise sweet malts quite well. The main quality that this beer has is that it is very drinkable and I can imagine this beer would be as at home on a Caribbean beach as it would with dinner, quite a compliment for a tropical lager! Overall I'm quite impressed with Carib. I did a little research and found out the only adjunct in this beer is some extra sugar, so as adjunct lagers go it's as pure as they come. This beer may not have the bitterness that I normally appreciate in a lager, but if you want that in a Trinidadian lager try the Carib Pilsner Light. That's a seriously nice lager, in retrospect it's probably the one I should have reviewed. 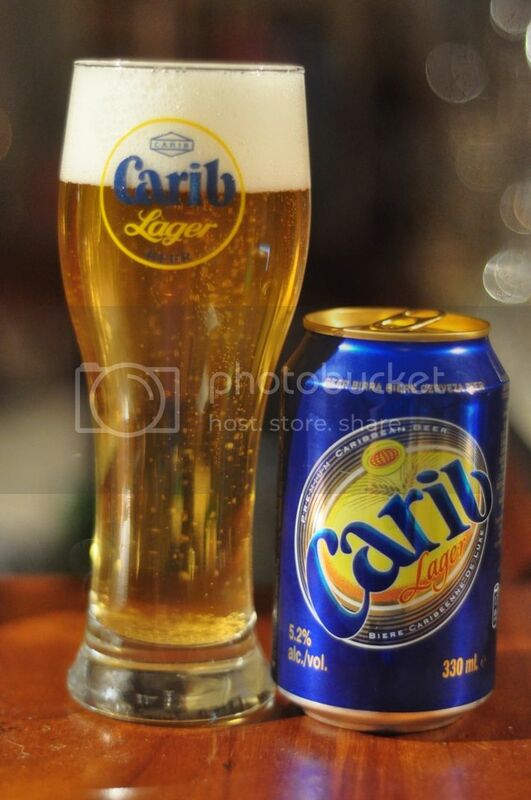 Anyway I liked Carib Lager and it's the best of the Caribbean lagers I've reviewed.